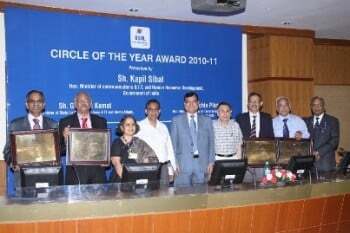 India’s National Telecom Backbone Bharat Sanchar Nigam Ltd (BSNL) conferred the “Telecom Circle of the Year Awards” for its key performing territorial circles, based on their revenue performance for the Financial Year 2010-11. BSNL’s Karnataka Telecom Circle and & Chennai Telephone District won awards in Category 1 and 2 respectively. 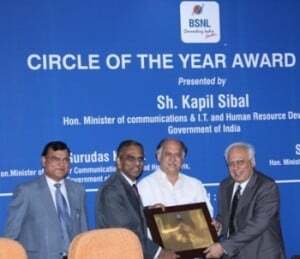 Orissa Telecom Circle and Himachal Pradesh Telecom Circles won the award in Category 3. The percentage revenue growth over the previous financial year is the key performance parameter for the judgment of the circle of the year under each of the above three categories. Three categories have been identified as : Category 1: Circle with an annual revenue of more than Rs.2000 crore. Category 2: Circle with an annual revenue between Rs.1000-Rs.2000 crore. and Category 3 : Circle with an annual revenue up to Rs.1000 crore. The awards were given away by Mr Kapil Sible, Minister for Communications & IT in the august presence of MOS for Communications & IT Shri Gurudas Kamat, Sachin Pilot and Chairman Telecom Commission & Secretary Dept. of Telecom, Mr. R. Chandrashekhar. Speaking on the occasion, Mr R. K. Upadhyay, Chairman & Managing Director, BSNL said “Most importantly turning around Bharat Sanchar Nigam Ltd to its former glory is the top priority We have to maximize our revenues from the existing levels. Then, there are a whole lot of business opportunities available in the market to tap. With the kind of reach BSNL has, it should not be very difficult to get a major share in the business. 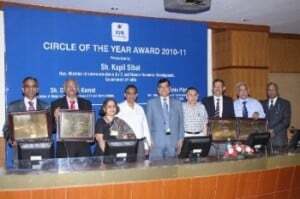 These awards have been conferred to identify our key performing circles and to inculcate a sense of competition among circles to try & win this award next year. Also it gives a chance for existing circles to compete in a higher category than the one in which they are present currently.” he added. I have experienced best services with bsnl broadband. I watch all youtube videos without any disturbance. The other private operators are worst service provider in india like airtel and vodafone. First i have used airtel 3G i have never experienced such horrible services then i switched to bsnl broadband. My parents use bsnl sim.